“Welcome to Cherry Blow Dry Bar! Can I get you something to drink?” Robyn greeted us as we stepped through the door. Transported into a luxe space reminiscent of salons in glamorous urban centers, the decor, mirrors, and chandeliers melt together seamlessly, urging visitors to put on their princess personas and relax. As we sipped on champagne, our stylists ushered us to the plush leather seats at the sleek bar. Kelly Walker, my colleague at Lifestyle Frisco, and I looked at one another with wide eyes… “I’ve never done this before!” we both admitted sheepishly. So, what is a blow dry bar? A blow dry bar is slightly different than a typical beauty salon. A blow dry bar focuses on short-term styling options using heat and products rather than cuts and color to create more permanent looks. Blow dry bars are becoming rapidly popular around the country and are especially convenient for special events like proms, Homecoming, or weddings. These beauty bars give customers the opportunity to try out new looks and be their most glamorous versions of themselves. 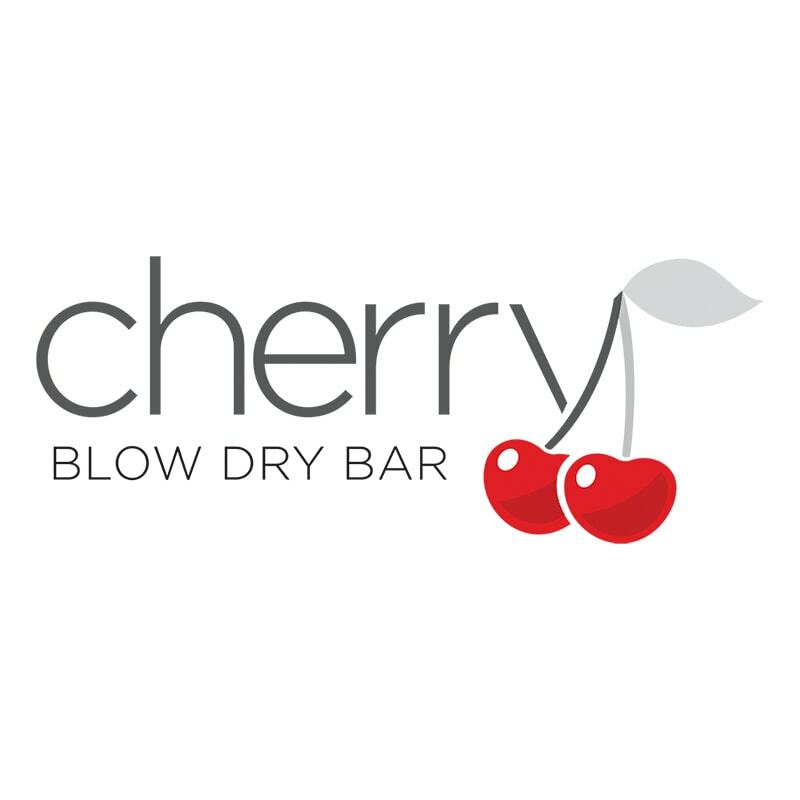 Cherry Blow Dry Bar is a franchise that was originally founded by two brothers in Cherry Hill, New Jersey. Shelly Maestranzi was excited to open the second Cherry Blow Dry bar in Texas (the other one is in College Station) and has plans to eventually open another location. Robyn, Shelly’s roommate from Illinois University, is excited to join her for the ride. The styling options vary widely, catering to every kind of hair and look and the starting price point is quite affordable. In addition to styling options and scalp and hair treatments, the beauty bar provides makeup and lash extension services as well as products from high-end lines such as Blowpro and Pureology. Alex explained each step of the process as she ushered me along. “Wash, rough dry, and then I start to style it!” she explains as she gets to work. I settled back into the leather and enjoyed the view of the Omni Frisco Hotel through the massive widows while I sipped on my champagne and Alex worked her magic on my messy #momming hair. She set the style with Blowpro’s volumizing mousse and blow-dry lotion, explaining the function of each product as she used it. The appointments are typically much shorter than the average salon visit, and soon Kelly and I were admiring our new styles. The visit felt like more than just a quick hair-fix – it was an education about hair care and a relaxing self-pampering session all in one. 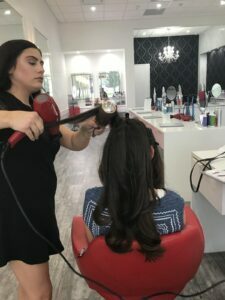 Women often visit Cherry Blow Dry Bar with their friends before a fun night out, and many executives and real estate agents will join as members so they can look great for meetings over the course of the week. If you haven’t had a chance to try out a blow dry bar yet, definitely take advantage of the convenience of Cherry Blow Dry Bar at The Star in Frisco. Make an appointment or drop in when you have an event or important meeting coming up, or simply when you’re having hair-envy and want a hair boost! October may be the best month yet to try out a new style since Shelly is offering a set of free lashes with all hair-and-makeup appointments through the end of the month. For fall and holiday weddings, Homecoming, or family and work events around the upcoming holidays, there is no better way to ensure that you feel glamorous and gorgeous than a visit to the Cherry Blow Dry Bar at The Star!